This example describes how to integrate ODEs with the scipy.integrate module, and how to use the matplotlib module to plot trajectories, direction fields and other information. You can get the source code for this tutorial here: tutorial_lokta-voltera_v4.py . We will use X=[u, v] to describe the state of both populations. 9     """ Return the growth rate of fox and rabbit populations. """ 2     """ Return the Jacobian matrix evaluated in X. """ 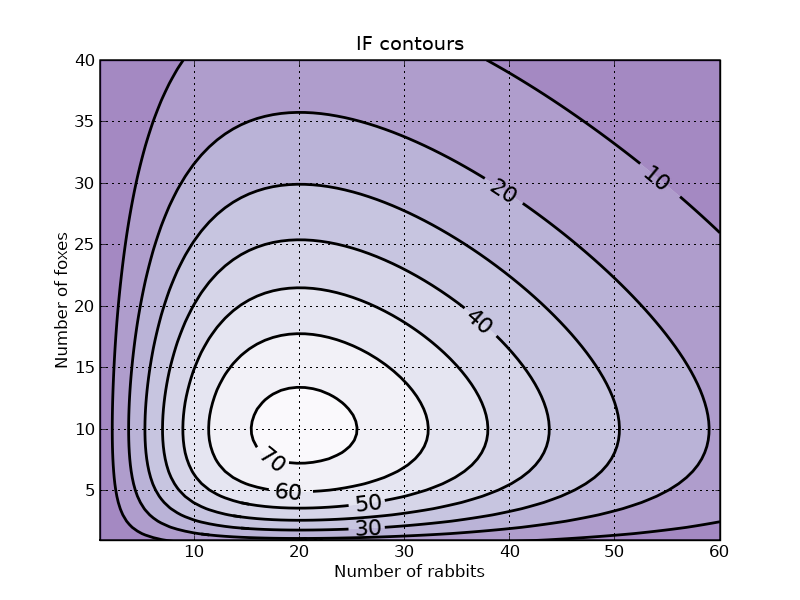 Near X_f0, the number of rabbits increase and the population of foxes decrease. The origin is therefore a saddle point. infodict is optional, and you can omit the full_output argument if you don't want it. Type "info(odeint)" if you want more information about odeint inputs and outputs. The populations are indeed periodic, and their period is close to the value T_f1 that we computed. We will plot some trajectories in a phase plane for different starting points between X_f0 and X_f1. 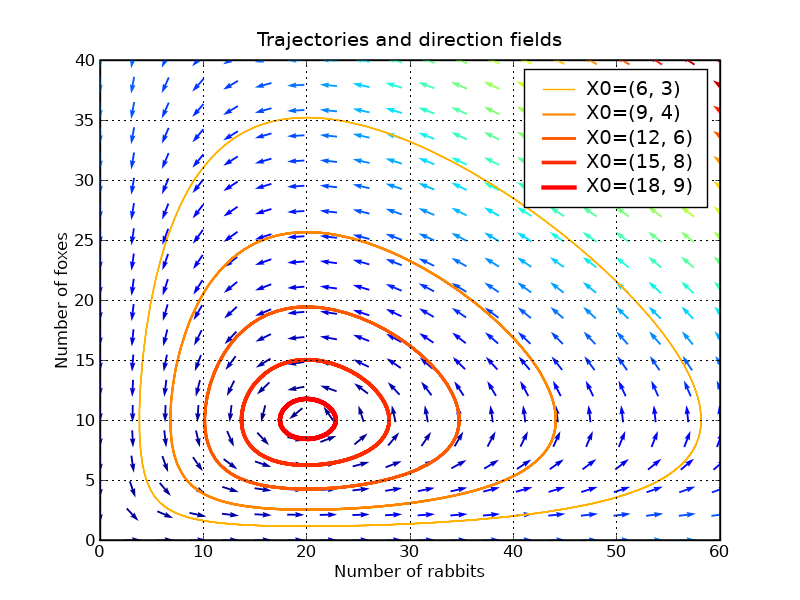 We will use Matplotlib's colormap to define colors for the trajectories. These colormaps are very useful to make nice plots. Have a look at ShowColormaps if you want more information. 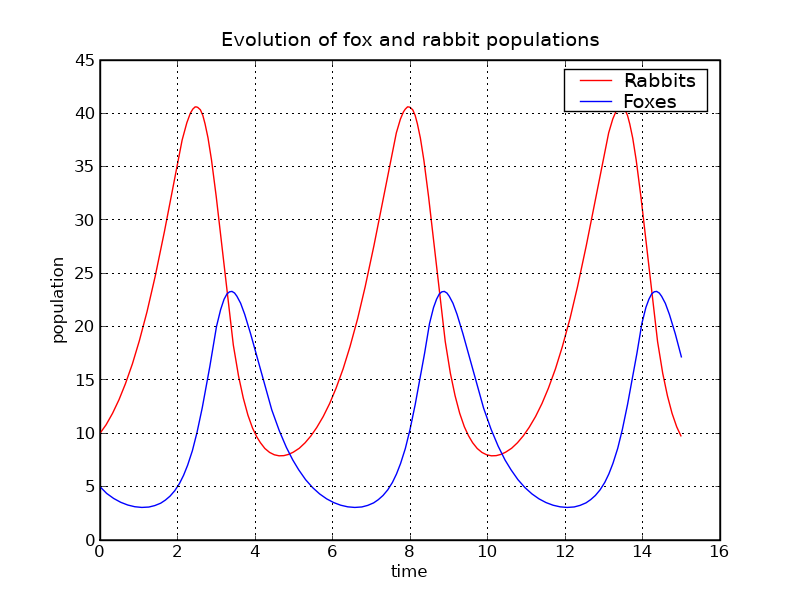 This graph shows us that changing either the fox or the rabbit population can have an unintuitive effect. If, in order to decrease the number of rabbits, we introduce foxes, this can lead to an increase of rabbits in the long run, depending on the time of intervention.